Through the development of Munsell color space, A.H. Munsell kept color education at the forefront of his work. So in 1902, with much of his color theory developed, he began to consider tools that would facilitate teaching the Munsell color space to children in grades 1-9. He had already developed the color research and was exploring additional tools such as a color sphere, which was the precursor to today’s Munsell color tree and color plates, which represent the predecessors to today’s Hue Value Chroma Charts. Munsell continued to work with science and academia on his book of color. However, in the meantime, and with the help of Miss Peterson, Munsell developed “The Munsell Color System,” a simple teachers’ handbook arranged for primary and grammar school teachers. The handbook included a review of color names that children learn in Kindergarten (red, yellow, green, etc.) along with what appeared to be rudimentary color charts to teach children how to order color. Of course Munsell’s hue, value and chroma attributes were taught early on in the curriculum as was the value scale. Munsell’s color sphere was an important teaching aid. The tools used to teach Munsell Color Space—color charts, color sphere and neutral value chart—remain staples in today’s Munsell Interactive Learning Kit. 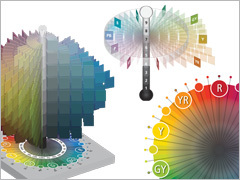 Learn more about Munsell Color Space. H. Munsell Color Diary, 1908-1918, Volume A Part 8. Courtesy of Rochester Institute of Technology, Munsell Color Science Library.